Can RAB help you get the book you need? Library doesn’t have a book that you want? Did you know as a student at the University you can request the Library buys books for its collections via the RAB (Request A Book) Service? Last academic year, 2013/14, the Library purchased 940 books in response to RAB requests. 134 books were ordered directly from requests from students in Social & Political Science, this made approximately 12% of the total requests from the College of Humanities and Social Sciences. You can see a full list of all 940 titles bought by the Library through this service on the Request a book purchase for the Library. How do I get hold of the book I need? Whether an item is already out on loan or is not available in the Library there are options available to you so you can get the material that you need. Is the book (or other item) you want already out on loan to another user? You can place a request on the item yourself via the Library Catalogue. If the item is “Charged” i.e. out on loan, then you can simply click on the Request Charged or Annexe item link to request the item. You must have your library barcode number to do this (this appears on your staff/student card and starts 20150…). You will receive an email when the item is available for you to borrow and you must collect this from the Requested items for collection shelves (in the Main Library these are in the HUB collection on the ground floor). This means that you can collect items any time the Main Library building is open. How do you get hold of a book (or other item) that is held at the Library Annexe? The Library Annexe is the Library’s offsite store and they offer a couple of request options so you can get hold of material from here. These requests can be done via the Library Catalogue. You can request for a whole book or journal volume to be brought from the Annexe to the Library for you to borrow (click on Request Charged or Annexe item link in the catalogue record). Or you can request for a journal article or book chapter to be scanned and sent to you electronically (click on Library Annexe scan request in the catalogue record). Does the Library not hold the book that you require? 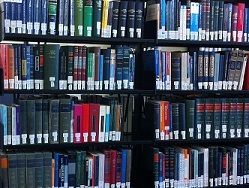 Through RAB (Request a Book) students can tell the Library about books that are not available in the Library’s collections and the Library will try to buy it. Go to www.ed.ac.uk/is/book-recommendations and click on Request a Book (RAB) (Students). Staff can also recommend books on the above book recommendations site by clicking on their relevant College. If you require the book quickly or if it is a journal article or other material you are looking for then you may want to try the Inter-Library Loans (ILL) service instead. The ILL service can try to borrow an item from another library for you to use, in the case of journal articles they will try to get a copy of the article for you. ILL requests are all done online via ILLiad, you must click on the first time user link to register if you have never used this service before. For more information on the ILL service please see the ILL website. Alternatively, you may wish to visit another library in-person to view material that they hold, see using other libraries.